Did you know? 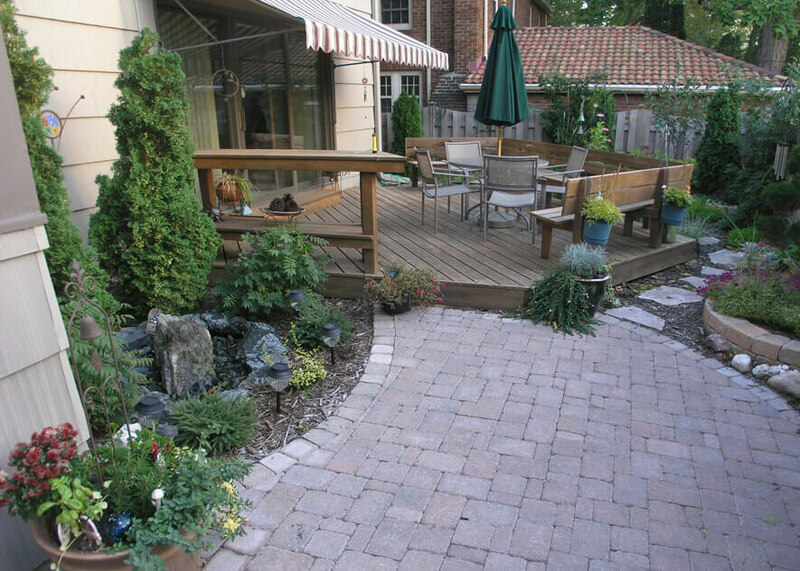 Patios can actually cost much less than decks when built at or near ground level! Decks and Patios fulfill the same purposes – to provide an “outdoor floor” for your outdoor living space. The way they provide that floor, however, is very different in terms of cost, maintenance, longevity, and suitability to your home’s setup. This article will discuss the pros and cons of both surfaces, show cost examples, and help you decide which you should choose. Our company can design and install both patios and decks (we have trusted partners who install the decks). The biggest reason for this article is to let you know that patios can actually cost much less than decks when built at or near ground level, which comes as a surprise to most people. Obviously, a second-story door means you will need a deck… but for anything under four or five feet off the ground, a patio offers greater design possibilities at a similar, or lower price. Let’s talk first about some basic differences between patios and decks. 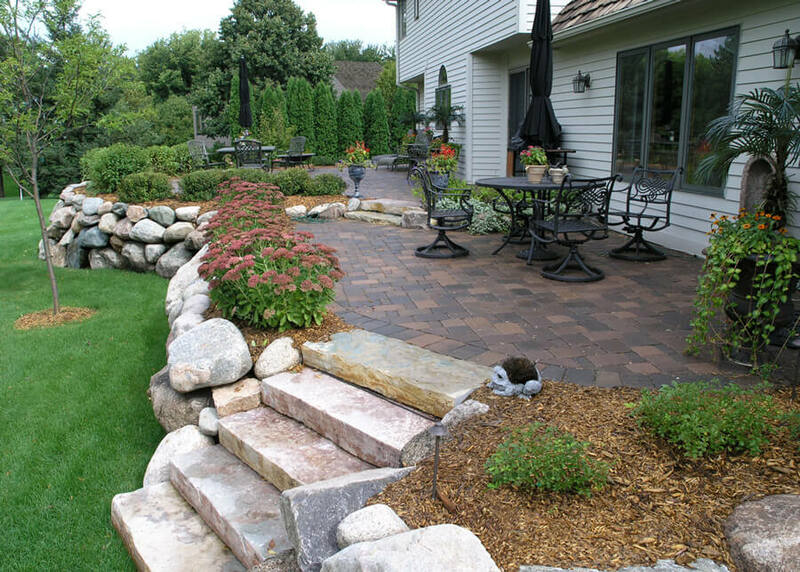 Patios are solid surfaces, sloped to allow water to flow off into your yard. They are not physically attached to your house, and in most cases do not require city permits or inspections. They can be excavated and built at ground level, or base material can be added and compacted to raise them feet off the ground. 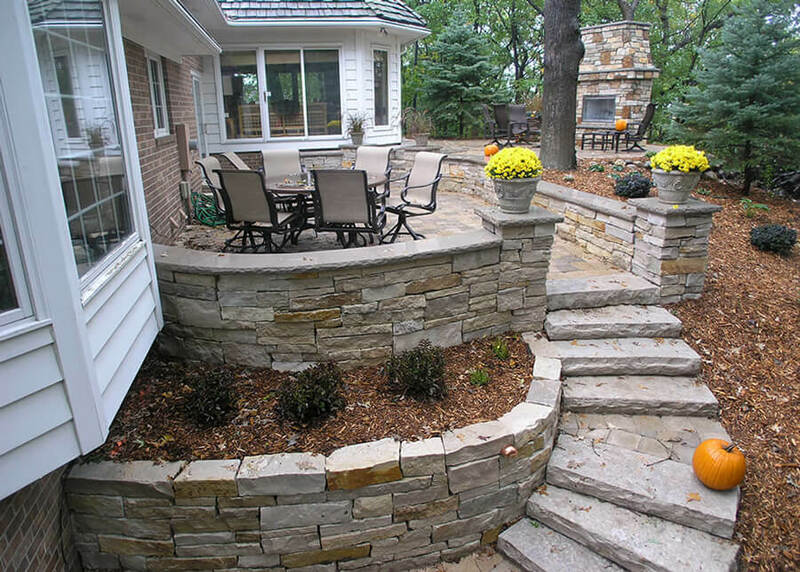 When raised, there is typically a retaining wall holding up the outside edge and steps leading down to your yard. The wall can be spaced to include area for plantings, which helps to soften the look the patio and wall. 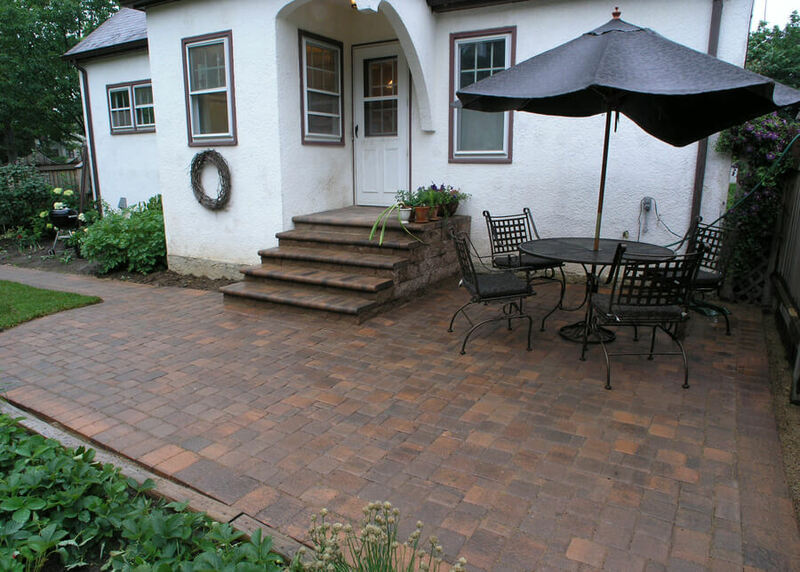 Both pavers and stone patios are extremely durable and resistant to the elements on their own, with no additional sealers or treatments necessary. There are sealers available to make them shinier or sealed and even more durable, but you can consider that an option and not a necessity. The only maintenance is occasionally sweeping more sand into the joints, but even that can be eliminated by using Polymeric Sand. Poly sand contains a glue element which bonds it permanently in the joints. 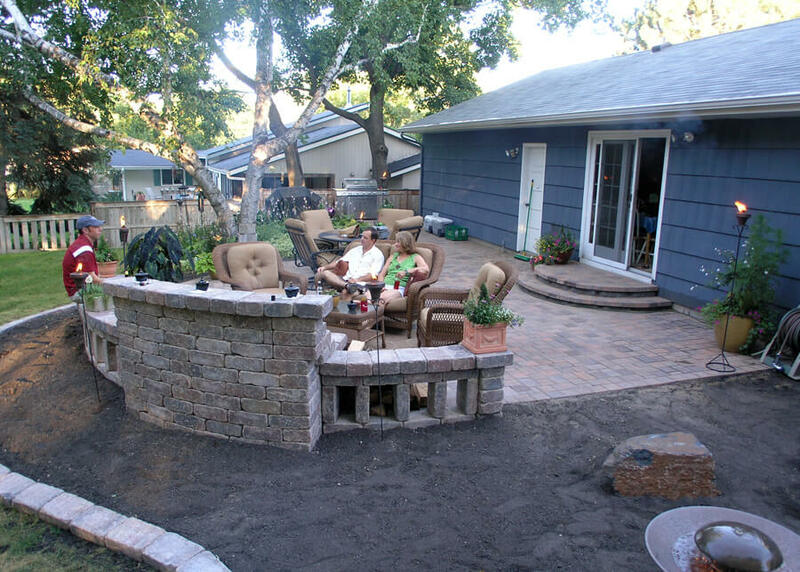 A patio can have a firepit, fireplace, or sitting wall right on it. It can also be surrounded by full plantings to make it a greener and more welcoming outdoor space and help it blend with the rest of the yard. Solid, nearly zero maintenance, very long lifespan (20-30+ years) if installed correctly. Typically cheaper than the same space made out of decking. Large plants and sitting walls can be installed right to the edge of the patio. Can be built to any size and shape. 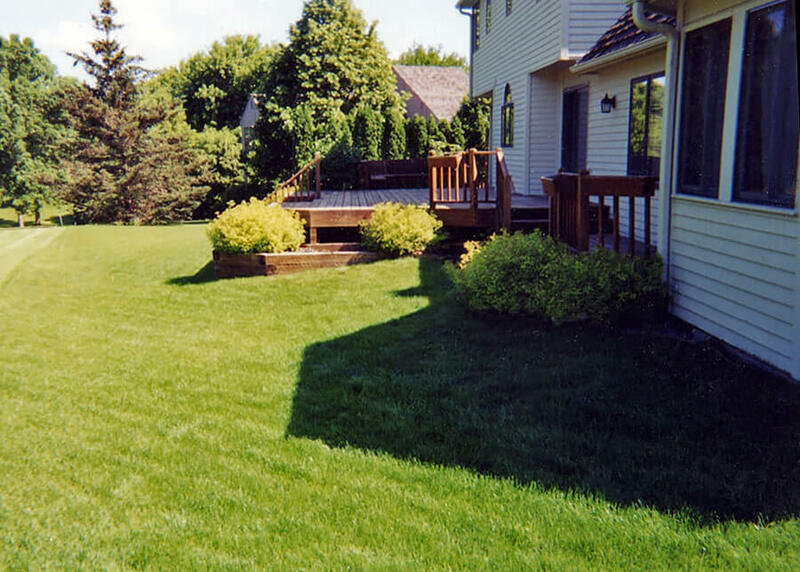 Requires a wall on the low end if you need to raise the patio feet above the existing lawn. Need to sweep sand into the joints every couple years. Different decking materials have different levels of durability. You either choose a wood product, which needs power washing and sealing every couple years, or a manufactured product which needs less maintenance but costs much more up front. If you use a manufactured product, you still have the joists and stair stringers made out of normal wood which will need to be sealed to maintain their lifespan. You can have planter boxes at the edge of your deck, but are limited to smaller plants. In general you can’t have a firepit or fireplace on your deck, but if you have a larger budget to work with and a high elevation, there are some amazing deck/fireplace/patio combinations that we can share. You may prefer the look or feel of decking. Cost difference to have a higher deck are fairly minor. Can incorporate benches or planter boxes. Only option for a second-story outdoor floor. Railings may block some of your view. Fairly frequent maintenance is required. Higher cost than ground level or moderately-raised patios. Water flows through, and very often causes settling in the dirt underneath. This can eventually cause flooding in your basement. If your deck is close to the ground it can be tricky to correct the drainage slope underneath it. We’ve been hired by many unhappy homeowners trying to add soil under a low deck: our best solution to date is to slide it in on a sled – not fun at all! The biggest influence on potential deck/patio design options and cost is the height of your door. If your door is close to ground level, you don’t need steps and can simply step out directly onto your outdoor floor. When your door is elevated, you can either raise the floor to meet the height of your door, or you can use steps to get from your door down to a lower floor height. Potential deck or patio designs should also consider the construction of your house. In some cases windows, egress windows, window wells, and height of foundation walls will influence which is the best design option. Contrary to many peoples’ impressions, patios are actually much cheaper than decks if you’re building fairly close to the ground. In our mind, a patio is always preferable if you’re going to need it within 2-3 feet of ground level. Even with the retaining wall and steps from the patio to your yard, or a stoop from your door down to the patio, the cost will be similar or less than an equivalent deck space. 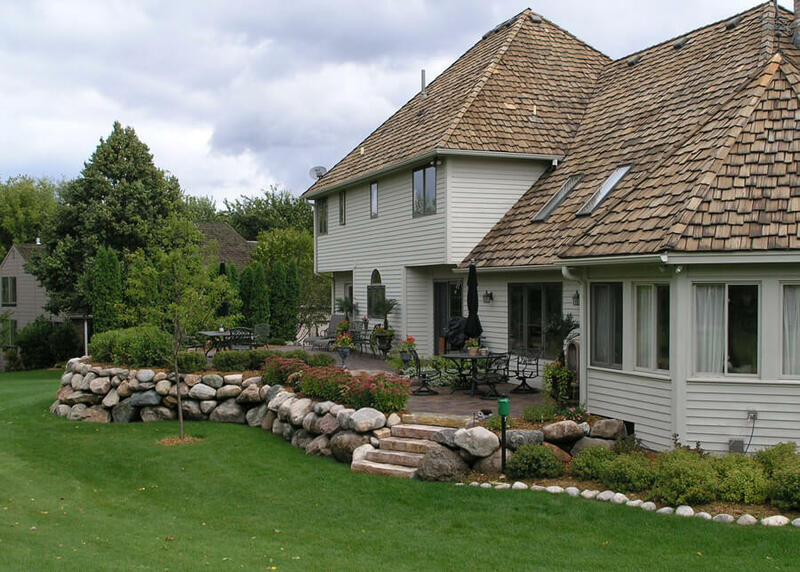 At four feet off the ground, the cost of the deck may be similar or may become less than the patio… it varies a lot with specific yard slope and other factors. A patio is a permanent solution which will require almost no maintenance and still look very good to buyers when you go to sell your house in the future. 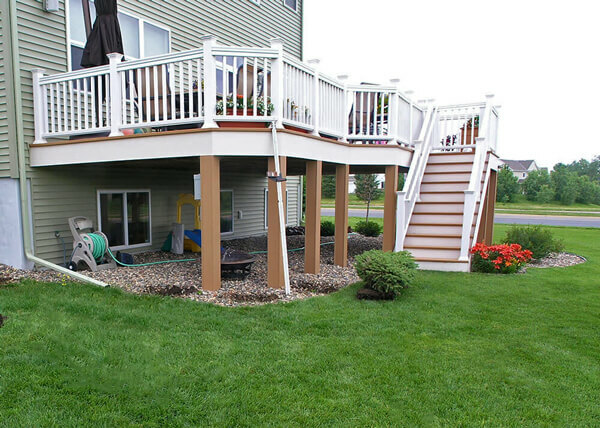 Decks unfortunately don’t look as good over time as patios, even with maintenance. Ten years down the road, buyers will see joists beginning to rot (or posts splitting) and think, “This is going to need to be replaced,” even if the deck itself is still structurally okay. With decking you are somewhat limited in size, as well. Beyond a certain length, lumber is special-order and becomes very expensive. Structural support also becomes more and more critical the larger the deck gets. Patios generally are built bigger than decks, because there is no particular limiting factor, or a point where the cost suddenly goes up. A larger patio just needs more base and more pavers. You can get whatever shape and size you want. Category 1: Door is at ground level or less than 8" off the ground. Function: When a door is installed at ground level, a patio is your best solution. Design: It’s best to keep the flow of traffic out the door on the same level. Adding a deck would either require a step-up to the decking boards, or excavation to allow the boards to be buried below which can lead to drainage problems and tight spaces for pests to call home. 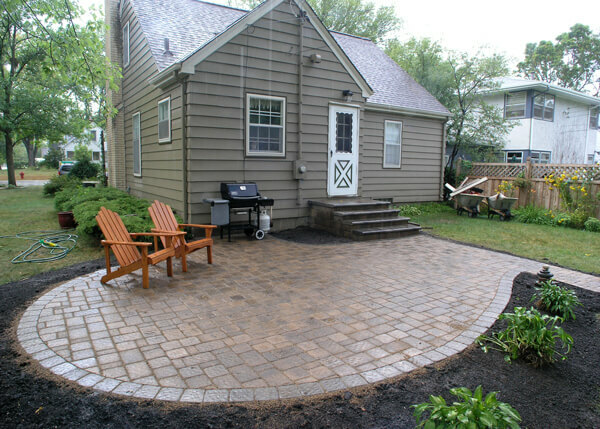 Cost: A patio installation will cost about 40% less than a deck installation for a ground-level area like this. For a 300 s.f. space, a deck would start at around $9,000, while a patio would start at around $4,500. Our Call: The patio is the better option. Category 2: Door is between 8” and 1.5 ft. off of the ground. Function: Either a deck or a patio can be used. Design: Design options include a raised deck, a ground level patio with a stoop, or a raised patio. All of these are nice options, and often times which are selected will depend on design taste, material preferences, and budget. 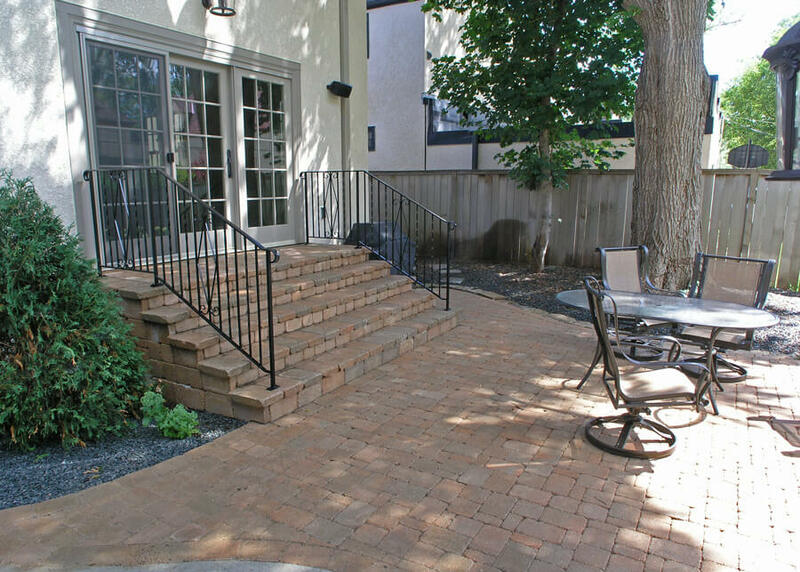 Our Call: The patio, whether with a stoop or raised fully with steps on the outside, is the better option. Category 3: Door is between 1.5 ft. and 2.5 ft. off the ground. Function: This category is very similar to the Category 2, with the exception of a bit more height. Decks, stoops and ground level patios, or raised patios can all be considered. Design: At 2.5 ft. off the ground, most municipalities won’t require a railing so the design considerations are similar to the slightly lower elevation designs. Costs: Exact design details and material upgrades, as well as the surrounding yard may affect pricing. As a ballpark 300 SF space, a deck and five steps would start at around $10,000. 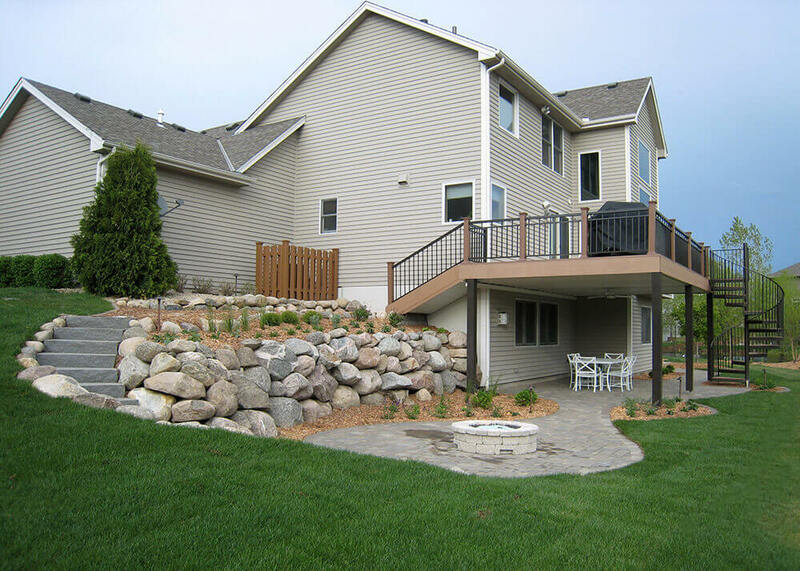 A ground level patio with stoop would start around $6,500, and a raised patio that is 2.5 ft off the ground with a boulder wall and five steps to the yard would start around $10,000. Our Call: Cost is still not really a factor. If all design options are open, I’d either do a stoop down to a full-sized patio to save cost, or do a raised patio with steps down to the yard. Category 4: Door is between 2.5 and 4 ft off of the ground. Function: In many cases either a deck or a patio can be used, however we should carefully look at the surrounding yard space and slope, local building codes, and the type of foundation that your house has. Option 1: Large stoop with steps down to a ground level patio. This can be nice to open the patio area up to the surrounding yard and have the space blend into the lawn area more fluidly, and the only railing needed would be on the steps. Option 2: Raised patio or deck. This has the benefit of a higher view of the yard, and a smoother flow into your house as it can be at the same level as the door. Typically a deck will need to have a railing around the perimeter, and a patio may have a railing or a planted buffer zone. Option 3: There are also designs that “split the difference”: do a few steps down from the door, a mid-level raised patio or deck, and a few more steps down to the yard. Cost: All of these are nice options, and often times which are selected will depend on what fits the house and yard the best, design taste, material preferences, and budget. Option #1 with a larger stoop will be similar in price to the Category 3 projects; maybe a few hundred to a thousand dollars more for the larger stoop depending on your material selection. For option #2, the raised patio or raised deck option, there is a big difference in price as well as the overall impression of the design. If your primary focus of the project is cost, a deck may be cheaper. 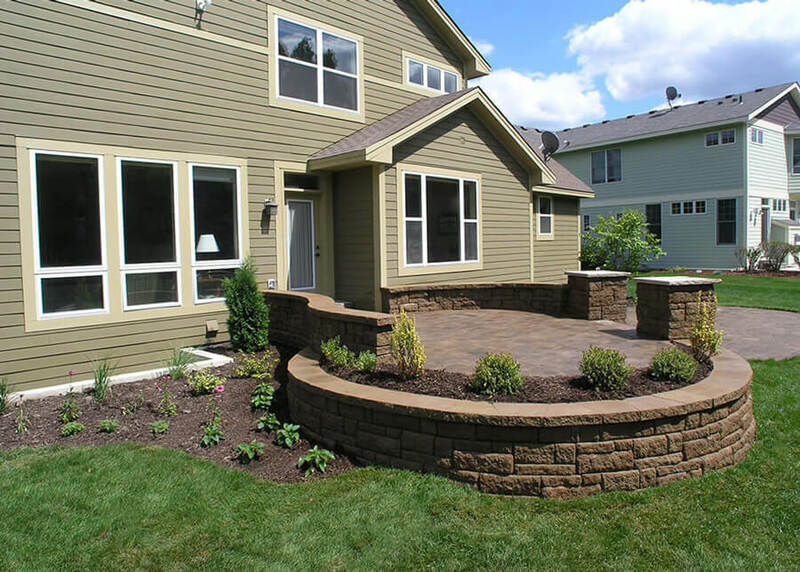 But, if the budget allows for a bit more, opening up to a hardscape design with patio and retaining walls can really give that “wow” factor to the space. Typically projects like this will have a really wide range of design possibilities which make it difficult to give pricing examples. As a rough starting point a 300 SF deck with railing and steps would start around $13,000. A 4ft high raised patio with a planting buffer instead of railing, boulder walls and eight steps to the yard would start around $15,000. Our Call: When the Outdoor Floor is raised 3.5-4 feet, the deck option can be significantly cheaper, although in some cases it still isn’t that different. I personally love the solid permanence and “wow factor” of a raised patio, particularly with nice plantings at the edge to soften the design. 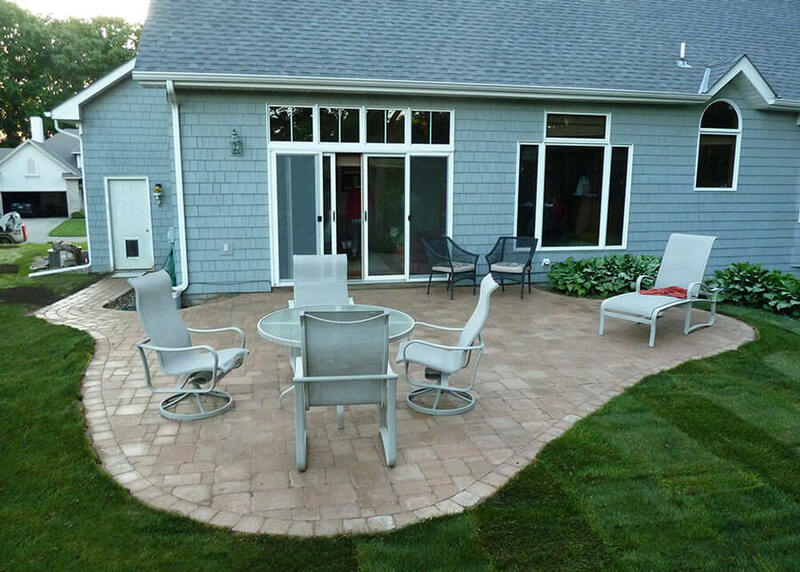 A raised patio gives more design options to add a sitting wall on the outside edge, a firepit or even a fireplace. But a deck can be very nice as well – this is really something we’ll have to talk through with you at length! Category 5: Second story decks! Our Call: We won’t propose a “solid raised patio” with a tunnel for your walkout door. In some cases, a deck is really the best answer. 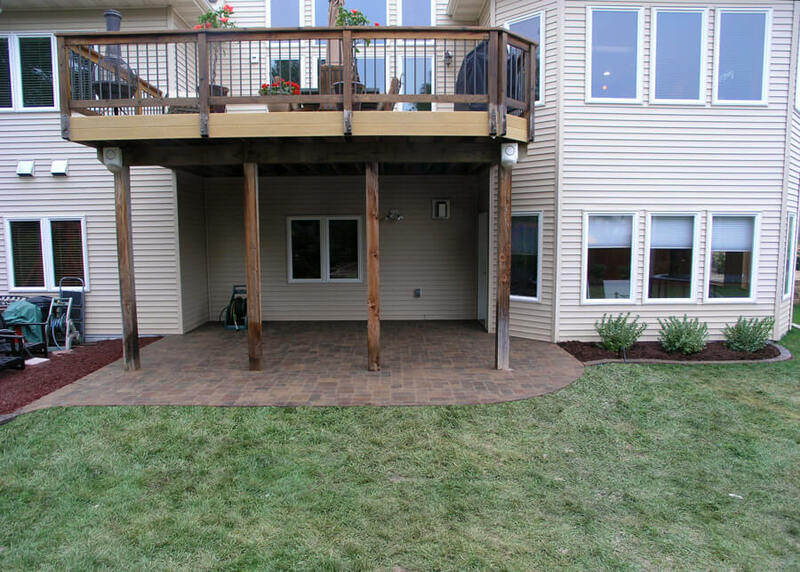 Either a patio or a deck is a great option to add usable outdoor living space to your Minneapolis-area home. Hopefully this article helps give you more understanding of the issues involved in choosing between a deck and a patio. To learn more, the best thing to do is contact us so we can get to know your ideas better and give you a lot more firm detail about what your potential project could be. We’re here for you; call anytime!